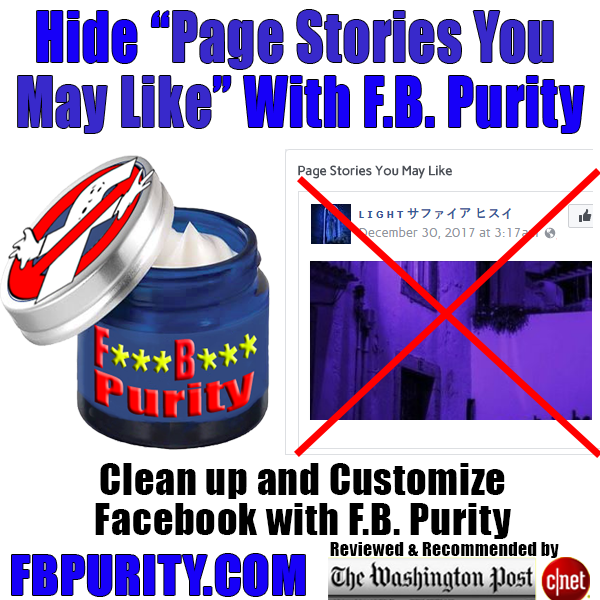 This entry was posted in Facebook, FB Purity and tagged block facebook ads, block page stories you may like, clean up facebook, customise facebook, Customize Facebook, hide facebook ads, hide gaming videos, hide page stories you may like, hide saved links, hide sponsored posts, hide stories box, hide stories on facebook, hide suggested posts, hide trending box, hide trending on facebook, page stories you may like, remove facebook ads. Bookmark the permalink. When I enable Auto Update within the add-on in Firefox V58.0.1 (64-bit), It doesn’t update. I’ve changed from the “Auto” to the “On” and in neither case will it update unless I do it manually by re-downloading the add-on. This feature has not worked for a long time including many previous versions of Firefox. Is this a known issue? Thank you. So this “Suggested Shows” thing. How would one go about hiding it? Context menu (the … one has zero options and the X is obscured and rendered unclickable by the content… Is this hidden in FBP? If so, in which section would it be located? Jf not, do you plan on adding it in a future update? hiding “Page Stories You May Like” if hide “sponsored box” option is turned on is broken again as of Feb 16, 2008. I have the hide “sponsored box” option checked but the page stories you may like is still visible. 2008? are you a time traveller? you need to make sure you have the latest version of FBP installed. I think he meant 2018. I am having the same problem. Those posts started appearing again last week sometime (forgot the exact day). We do have the most up to date version installed on all our office computers. Is it possible our work network is somehow causing the problem. None of us has seen it on our home computers, but everyone in the office is having the same problem.